David Wilson is a canal enthusiast and amateur photographer. 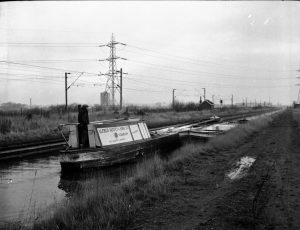 In the 1960s and 1970s he recorded much local commercial canal traffic, including some of the workings between Albright & Wilson and the Rattlechain Lagoon or Brickworks. He has had many of his photographs reproduced in several publications concerning local railway, road and canal traffic. He is local to the area, having grown up in Greets Green, West Bromwich. In addition, he has lived in Horseley Heath, Tipton, since 1966. He records his observations below. “During the late 1960s & early 1970s, I witnessed the late stages of commercial canal traffic, in the West Midlands. The main regular traffic, was, gas oil from the various gas works (Walsall, Swan Village) to Oldbury. This was undertaken by “Clayton’s of Oldbury” in flush decked craft. I believe this traffic ceased around 1968. The other regular traffic was phosphorous waste, taken from Albright & Wilson, in Oldbury, to a disposal site near Dudley Port. The boats used for this operation were owned by “Alfred Matty”, who were based at Coseley. The waste was in liquid form, and I seem to recall this waste had a distinctive odour, which reminded me of the smell at the swimming baths. The boats bore the greenish stains, and the cargo (to me) seemed hazardous. The phosphorous waste material, when at its destination, was to be then pumped into the marlhole. 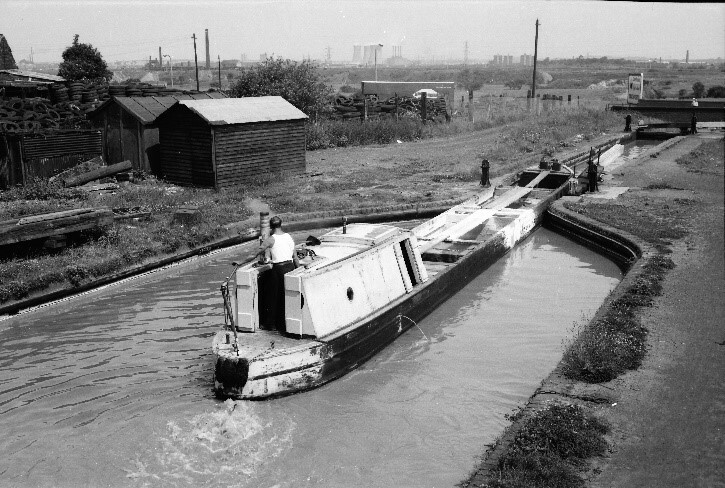 1965, Matty boat descending the Brades Locks en route to discharge hazardous cargo at rattlechain lagoon. Note the rattlechain brickworks buildings and stack still in evidence to the top left of the picture. Also the staining of chemicals on the boat as David describes. Picture Copyright David Wilson, reproduced with permission. 1971, matty boat heading in the direction of Oldbury. Note the pumphouse building David refers to on the right of the picture on the towpath just partially in shot. Picture Copyright David Wilson, reproduced with permission.